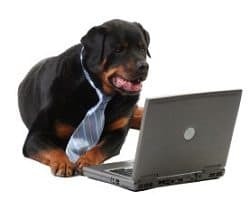 As the proud owner of a Rottweiler, we understand that they are large dogs with an independent mind­set. They tend to go where ever they want, whenever they want, and it can be quite frustrating at times. Especially when you are trying to do something important, like bringing your groceries in from the car, cleaning, cooking dinner, or leaving for work. Stay calm, stay focused, and be patient! 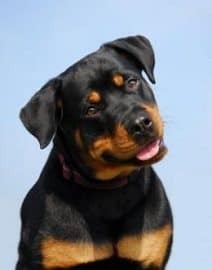 Your Rottweiler has a short attention span, so keep them focused on you! Start off with small increments of time and distance, increasing each time they stay put for you. Always approach your Rottweiler for their reward! They are not eligible for a reward if they break the stay position and come to you.